Most new members join through referrals by friends who are already members, but you may contact us directly. Opportunities abound to meet people who share a common interest in fine dining, wine & building friendships. We are comprised of professional & non-professional gastronomes. 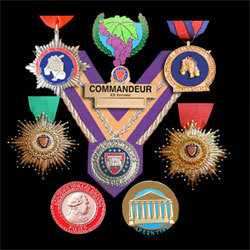 Rank is signified by ribbons of different colors, bestowed at formal induction ceremonies. Spirited Themes such as Gala dinner dances; Brunches; Cruise Ship Luncheons, Wine Tastings, etc. Exciting Venues : Wine Cellars, Resorts, Cooking schools, Private Clubs, Residences, Yachts, Galleries, etc.